I’m excited to join Raimey Gallant’s #AuthorToolbox monthly blog hop (third Wednesday of each month) with the theme of resources/learning for authors. Posts are related to the craft of writing, editing, querying, marketing, publishing, blogging tips for authors, reviews of author-related products, anything that an author would find helpful. We share our experiences as it relates to these topics. Interviews are also permitted as long as they provide valuable knowledge for authors (i.e. advice.) Straight book reviews are not permitted unless they are reviews of books about writing/publishing/etc. With so much of writing now digital, the days of “the dog ate my novel” are gone. It’s simple to track, isn’t it? It’s either in My Documents or the cloud. Maybe. Should be but the new problems are “Someone stole/hacked it” or “The cloud ate it”. Every adult I know (myself included) has lost a critical, time-sucking digital file. It was saved wrong or got corrupted or simply vanished. The reason doesn’t matter. All that matters is that a week’s worth of work is no longer where it should be; now it’s forever-gone. There’s a learning curve to knowing where to save files, how to do that correctly, and then ultimately how to retrieve them. It can be especially complicated when you use different digital devices or if you use an online webtool that saves work to their server (like Canva). Search for the exact name or whatever part of the name you know. If you don’t know the file name but do know the file extension (maybe it was created in Google Docs or Excel), search for that using the general search term: *.[extension]. Most programs have a default location where files are saved. This may be preset or it may be the system default. 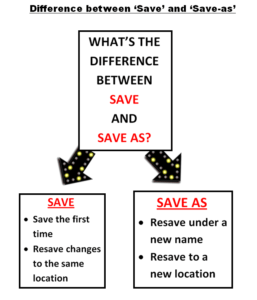 Did you ‘save” or “save-as”? “Save” puts the file in the same spot it was opened. It takes about half a second to find it. “Save-as” changes the location where it’s saved or the name under which it’s saved. Some people don’t know the file name. If you make a habit of appending the date when saving files, that helps. When did you create the file? In the search box (or simply push Ctrl+F), type datemodified. A calendar will appear; select the date for when you believe the file was created. If it’s not in the drive you selected, reselect to search another drive. If you don’t remember what date you created the file, start in the digital device’s “Recent” folder. This is found not only in the digital device being used but in many programs (like Office). Here’s one more way to search by date created: If you’re on a PC, click Cortana on the taskbar and a list of recent activities shows up under ‘Pick up where you left off’. This includes the most recently saved files. Sometimes, you delete the file by accident. It’s always worth checking the trash. If it’s in there, it’s easy to restore. What digital device were you using? Were you using your laptop? Desktop? iPad? Smartphone? You may have saved the file to that device’s local drive. I’d love to hear what you do when your files disappear. Thanks for this. I have a bad habit of moving files around and then losing track of where there were last so there’s a good chance I’ll need this sometime. Stuff like this can be stressful! It’s nice to know there are hacks to help us technologically wayward souls…! They’re good first steps. If you didn’t purposefully toss that doc in the trash and then empty the bucket, it’s probably somewhere you can retrieve it. I’ve started using my Google Drive because I can access files from either of my computers. Other than that, I’m with you! 😀 I do use a lot of USBs. Hehee. I have so many bookmarks, I can’t find anything in the list! Oh, man. I really hope I don’t ever have a need to read this post again. 😉 Thanks for the tips! Isn’t that the truth! I have another trick I use with my students. Sometimes, the Word doc they’ve spent hours on disappears off the page (yeah, we all know how that happens). I can go into Revisions and reinstate an earlier version. I am such a boss that day! With super powers! Great suggestions, organization truly will save the day! That’s the truth, isn’t it Phillip? Great insight and suggestions on how to track down a digital file. I recently re-discovered my trash file and all the nuggets of past drafts there. Save vs Save As is probably my lifelong battle to recall which I chose for my most recent WIP draft. Thank you for compiling these here and reminding me that saving in a consistent location is a must! I save by date, so a new save every day, but I collect them on my desktop. It’s the only place I’m sure to find them! This is really useful! I save to a flash drive and a backup drive on my computer after every writing session, so at least I won’t lose everything. A good friend of mine also emails her daily words to herself. Gone are the days when only a flood or fire threatened our manuscripts! I like the email approach. Redundancy is my friend. This is helpful. I haven’t lost anything recently, but I have in the past. Oh my gosh, Jacqui! I’ve bookmarked this post. What a great topic to show a writer how to find her document. Thank you, thank you! I’ve shared it online. Thanks for sharing! It’s like a dentist. You don’t care about them until you’re desperate. That’s what happens with lost files. I had a bout with Dropbox. My computer restarted (Thanks, Microsoft) and my Scrivener (set up to back up all its docs on Dropbox) was open to 65K story I was working on. When I restarted I didn’t have access anymore. 65K gone. It took weeks to find the simple answer. All I had to do was look in my Scrivener back-files on my computer. It was all there. I hate that. I guess that falls roughly under checking the site you wrote in–it may be on their server–but with a bunch of twists. I never would have expected that. Glad you got it back, Anna. I’ve misplaced digital files on my computer a million times. Thankfully, it doesn’t take weeks to locate unless it was a long time ago that I created it and did not properly put it where I intended it to be. Soon I will begin archiving photos to iCloud after learning Flickr’s storage policy has changed. Which is a huge bummer! I spent a lot of time getting my files on there and now 2T free storage is going away. The cost is more expensive than iCloud for what I need so I will make sure to remove my photos from their server before they do. Thanks for sharing these tips. They are a good help! Didn’t know that about Flickr. Not good. Thanks for telling us! I’m sure anyone who has a Flickr account knows if they didn’t disregard the email notice. That’s how I found out. Boy, was I upset, too! I don’t use Flickr. Well, I have an account but do nothing with it! 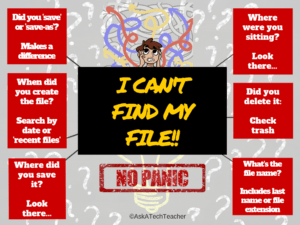 Great advice, Jacqui, I have had personal experience desperately looking for a file and find it saved locally on another device … and this has happened more than once! You just slap yourself, wondering how it got from where it should be to where it ended up. Mostly, I have no idea. I just start browsing around. This happened to me with a major apple operating system update. I panicked! It simply took everything on my hard drive and reorganized it into cloud! I couldn’t believe it. Sigh. At least I found everything. Happy Hop Day! This is great info. I’m a mac user and have used the “recent items” feature more times than I can count. Thanks for this! I rarely use it–duh. When I found this while researching this article, I couldn’t believe I’ve never included it in my teaching! This is great info. It’s not fun losing work you’ve spent hours on. Thanks for sharing! It always feels good when you search for an hour–and find it! What a moment! Great suggestion, Louise. I’ve done that myself. It’s a wonderful quick way. Oh my god, thank you! My cloud eats files ALL THE TIME and I am so clueless! This was so useful! Just as bad, my Cloud is supposed to sync but often doesn’t. I hate it sometimes! Those files rarely evaporate. It’s just trying to figure out where the h*** they went! Apple has done that to me more than once. I don’t know how that happens. What a timely article for me. I searched last night for a file I had written 3 years ago. I had no idea which device I saved it on, so I had to try each laptop.. (I never used the cloud or dropbox 3 years ago.) And I didn’t want to go through every stick from 3 years ago. Of course, I had no idea what I named the file, but it was about growing tomatoes, so I typed in tomatoes in the search box of the laptop and I found it! About the cloud…is that supposed to be more secure than your own laptop? What if the bad guy gets the keys to the cloud and then access to the whole world’s files? Wait. I think a new novel is appearing in this long comment! Thanks for the info, Jacqui. Very helpful. Good ending to your story, JQ. Glad you found that file. The Cloud is only as secure as the Cloud Tenders and we’ve all seen how that works out. But then again, our own computers aren’t all that safe either. A good solution for that really important stuff is to save it to a flash drive and then “air gap” it from your computer–don’t keep it plugged into the USB port so if your computer is attacked, they don’t find it. Another solution is to turn the Internet off but who wants to do that?? Fortunately, Jacqui, my day job has prepared me well for saving and retrieving files. An excellent article as there is nothing worse than not being able to find your work. Did I miss anything? Sometimes, there’s no way to save them from getting lost, don’t you think? Great tips. That is very helpful. Clever of you too, showing us how to approach the problem in the way we think about it. I have lost more than my fair share of files. Each one ruins my day, my week, or worse! Great tips, Jacqui. When writing, I always save my document to the laptop as well as the cloud. Every second or third time, I’ll save to my flash drive too for extra security. That said, I somehow lost a half day’s work recently. No idea where it went. Yuck! I hate that! Word used to regularly crash on me and I began to save about every two minutes. I don’t know why it did and now it doesn’t. Sigh. Oh my goodness – one more invaluable post my friend. “Cloud eating? – perhaps a consequence or CAUSE of global climate change? I think the “cloud” would have horrible indigestion from all the junk it gobbles up . . . I think it does! I have no idea how that name ‘cloud’ stuck! Very useful but I tend to save in files on my computer, so I usually know where things are. But I’ve taken note of several useful pieces of info here. Thank you. That’s exactly what inspired this post. It started with my students but soon, I realized lots of adults have the same problems. I find the Windows interface slow and clunky. I’ve used the Funduc.com Search and Replace program for years. It allows a person to search for files not only by name/type, but also by words contained within the file, and it’s faster than File Explorer. I loved when Google included your own computer in their searches but that went away (for obvious reasons). You’re kind to call Windows ‘clunky’. I have a worse word for it. Love your post on Toes today. Who knew there were so many descriptive terms! Ha. “Clunky” is an understatement but appropriate for mixed company. Thanks for popping over to my blog. I just followed you–love discussing words! Thanks for this, Jacqui. I’m find myself a little perplexed by the cloud. Now my flash drive, I understand. I love my flash drive too. I have a 256 gig one–very large. I’m eyeing the 512 gig version but it still runs over $100. I like that I can grab it and run, whether the internet works or not.. Such a useful post. Just when I’ve mastered backing up files on a stick etc, I’m given a cloud, something I can’t touch or see, so how am I meant to understand it? This begins to make a little sense now, so thank you for your calm good-sense. Clouds were a wonderful invention for my students. I can’t tell you how many of them lost their flash drives with everything on them. But clouds aren’t without their own complications. I’m willing to learn, just not ready to let go of my memory sticks, yet.